All transactions are safe and secure with a reliable history in online purchasing behind each of our associates. 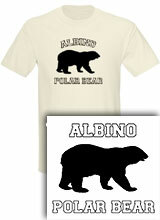 Buy the Albino Polar Bear Hangover 2 t-shirt to own Hangover 2 clothing and merchandise. When you get your wolfpack together around a bonfire you never know exactly what topics will come up or what stories will come out. Alan had quite a tale for the rest of the gang in the movie Hangover 2. He spoke in amazement of how his uncle had seen an albino polar bear, only for Stu to question how he would know considering polar bears are white. Alan matter-of-factly stated because it was black. Catch an albino polar bear yourself by getting this Hangover 2 tee. You sure it wasn't a black bear? In addition to the Albino Polar Bear Hangover 2 tee above, browse the Hangover 2 Clothing Gallery for more apparel like men's and women's clothes, kids shirts or hoodies.